Dash cam video caught the moment a house exploded in Stafford Twp., N.J.
STAFFORD TOWNSHIP, NJ -- Video from a police cruiser's dash cam shows the moment a house exploded on Tuesday in Stafford Township, New Jersey, leaving 15 people injured. The video shows emergency workers already on the scene, responding to a reported gas leak. Without warning, a fireball erupts, throwing a massive amount of debris in the air. The cruiser even shakes as the shockwave hits. Among the 15 people who were injured include seven New Jersey Natural Gas workers, six firefighters and two EMTs. Two of those injured were flown to the hospital and last reported to be in critical condition. The injuries to four of those victims were described as non-life-threatening. "We're very blessed and fortunate to have a lot of these guys here. A lot of them are volunteers," said Mayor John Spodofora. "Our fire department and first aid squad were there immediately." Chief Jack Johnson of the Stafford Twp. Volunteer Fire Department said he had never seen anything like it. He estimates he was just 50 yards from the blast. "It happened so quickly, the explosion - we had debris all around us, it came from nowhere. It's something you don't expect to happen," said Johnson, who suffered minor injuries in the blast. "I saw one of my guys get knocked to the ground. It's something I never want to experience again." The explosion happened just after 10:30 a.m. at 59 Oak Avenue. "It sounded like a bomb, like a mini earthquake, that's what it felt like," said Max Vanness of West Creek. PHOTOS: House explodes in Ocean Co.
A house explosion in Stafford Twp., NJ resulted in a number of injuries and dozens of evacuations. New Jersey Natural Gas spokesman Mike Kinney said workers were originally dispatched on Tuesday to investigate a report of a natural gas odor at the scene. Soon after they arrived, the home exploded. Additional workers from New Jersey Natural Gas continued to look for a gas leak even after the blast, finally shutting it off shortly before 1 p.m. Some 75 homes were evacuated in the area. Part of Route 9 was shut down for much of the day, but has since reopened. In addition, some 300 homes have gas and/or electricity shut off in the area. A number of other homes were also damaged in the blast. 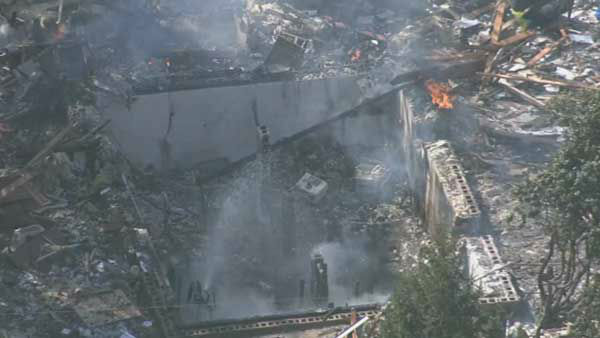 The view from Chopper 6 HD showed a scorched area where the house once stood with fire and smoke rising from the scene. A community center was opened up for residents in need of shelter.